"Corrabola House. County Longford Ireland"
"Corrabola House. County Longford Ireland". 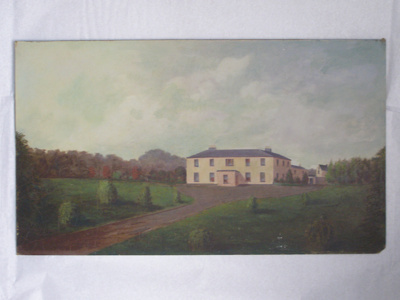 Oil painting of a Georgian country house with drive and gardens. It is understood that Corraboola House was the Morrow family home. Painting was possibly completed by Arthur Morrow in Ireland prior to emmigration to New Zealand in 1861, aged 19, rather than from memory or a sketch. Label on verso indacates that the "Prepared Academy Board" by Winsor & Newton was purchased at Rathbone Place, London rather than form a New Zealand agent.